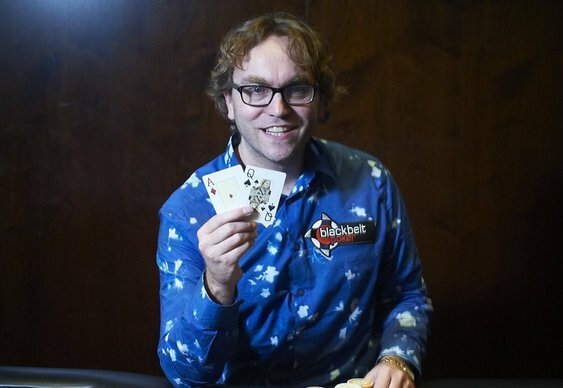 Neil Channing and the Black Belt Poker team left their usual southern home and headed north over the weekend for the site's first ever Newcastle Live event and after two days of hard fought action the winner was … Neil Channing! Yes, Mr Black Belt Poker triumphed in his own tournament, outlasting a 63 runner field at the city's Aspers Casino. Channing started the final table with the chip lead and barely made a misstep en route to claiming the £3,650 first prize. Bluff's regular columnist took total control of the tournament with a double elimination when play went four-handed. Tristan Chaplin made the first move with a pre-flop min raise that was called by Channing and Andy Brisland. Chaplin put in a continuation bet on the 7d-Jd-10d board which was called by Channing. Brisland then pushed all in, a move that was followed by an all in from Chaplin. Covering both opponents, Channing made one of the easiest calls of his career tabling Ad-5d for the nut flush which was plenty good enough against Chaplin's As-Qd and Brisland's Kc-Jc. That left just Paul Lamondy to try and prevent a 'home' win but a four to one chip deficit proved too much to overturn. The chips hit the middle with Channing well in front with AdQs well in front against Lamondy's Ac2c. Two clubs by the turn provided a river sweat but the final card was a harmless 6h which gave Channing the win. And what did Neil put his victory down too? He “Ran like God” apparently! Join Neil and co at the online tables and earn double Belt points on deposits up to $100. Sign up at BlackBeltPoker.com. Image courtesy of Anne Laymond and Black Belt Poker.